There remains a large amount of interest at state and local levels in using transportation investment as a means to promote economic development. Cities and regions that are growing slowly or not at all view improvements to infrastructure networks, especially transportation networks, as a potential way to stimulate growth by lowering the costs of local firms and making their location a more attractive place for private investment and expansion. Transportation investment programs often become more attractive when coupled with the offer of grants from higher levels of government. They also benefit from the reputation of infrastructure projects as a “safe” type of investment during periods of lower growth. This has been seen most recently with the United States government’s promotion of the American Recovery and Reinvestment Act, where infrastructure spending became emblematic of the bill’s efforts to promote employment, despite being a relatively small portion of the overall spending. Yet, as fewer resources have become available for such projects at the state and local levels in recent years, state departments of transportation and other public works organizations have begun to sharpen their focus to determine where and how such resources should be deployed to yield the greatest returns. This study evaluates the potential of transportation investment to generate increases in private economic activity by empirically examining a recent set of case studies of highway improvement projects in Minnesota. Transportation investment is but one of the competing factors influencing patterns of economic development, and so as a first step in our study we examine the empirical literature on a number of factors, including transportation, that have been cited previously as affecting development. The factors reviewed include things like human capital and education, taxation and regulatory regimes, quality of life factors, and other types of non-transportation infrastructure such as sewer and water systems, schools and telecommunication systems. Broadly speaking, the factors centering around human capital and labor quality seem to be most important. Taxation and regulation levels are fairly important as well, though they seem to matter less at the national level than at the boundaries between state and local jurisdictions. Quality of life factors remain fairly prominent as well. The most cited factors in this category include things like favorable climates, which have accounted for a great deal of variation in regional population growth in the U.S. over the past several decades, as well as environmental quality and other natural amenities. Since some of these factors (e.g. environmental quality) are under the purview of state and local governments, they tend to complicate the analysis of factors such as taxation and regulation, as a full accounting these factors requires an analysis of their outcomes (e.g. how tax revenues are spent). Many types of non-transportation infrastructure have been found to correlate with economic development, though the direction of causality between them has not always been clearly identified. Finally, much of the evidence on the relationship between transportation investment and economic development suggests that there could be some moderately positive growth effects from improvements to transportation networks, but that the returns to transportation investment have been generally declining over time as many types of networks have matured. How do transportation improvements translate into effects on economic growth? Theory suggests that different forces are at work depending on where the improvements are being made. Within urban areas, the primary contribution of transportation improvements for many types of industries is their ability to facilitate agglomeration effects. Firms in the same industry within a city may benefit from the use of certain shared inputs, such as specialized pools of skilled labor. A highly developed transportation network could increase firms’ access to these types of inputs and thus make them more productive. Outside of large urban areas, several other types of effects might dominate. These include the ability to expand the use of existing resources such as labor and capital (a scale effect), increases in the productivity of existing inputs, and the attraction of new resources and productive inputs (people and new firms) to an area. Several of these effects can take place simultaneously in response to a transportation improvement, thus making it difficult to disentangle their relative contributions. These processes are not often observed directly due to the lack of quality data at the level of an individual firm. Thus, many analyses of transportation and economic activity rely on data collected at a geographically more aggregate level. In this study we focus on private sector earnings and employment data, collected at the county and city level, respectively, as appropriate measures of economic activity. Both data sources are used to construct panel data sets, which can be used to estimate the effects of the completion of the projects over time. The first part of our analysis focuses on the case studies of the expansion of US 71/TH 23 (including the Willmar Bypass) near Willmar, Minnesota and the expansion of TH 371 (including the Brainerd Bypass) between Little Falls and the Brainerd/Baxter area. In both cases, county-level earnings by industry are used as the unit of observation. The analysis focuses on the construction, manufacturing, retail and wholesale industries as these have been identified in previous studies as “transportation-intensive” industries. Earnings data from 1991 to 2009 are collected for the county (or counties, as is the case for the TH 371 project) in which the project is located, along with neighboring counties, forming a panel data set. These data are used to fit an earnings regression with controls for population, state-level earnings in the industry of interest, and national output. The model is estimated using a panel correction technique that accounts for correlation across panels in the data as well as serial correlation. The effect of the improvement is estimated via a series of interaction variables that identify the county in which the improved highway is located, along with the time period of the observation (pre-, post- or during construction). Results indicate that none of the industries studied in either of the case study locations show evidence of statistically significant increases in earnings following completion of the respective improvements, once population and macroeconomic trends are controlled for. regressions have a similar structure to the models used in the analysis of industry earnings, except that the “treatment” effect of the highway expansions are specified differently. Cities in the sample are stratified according to their location relative to the improved highway. Cities are identified as being located along the improved highway segment, upstream or downstream from the improved highway (and thus likely to still receive some benefit), or neither. Again, these location attributes are interacted with variables identifying when the observation took place. Due to the shorter time series element in this data set, only pre- and post-construction periods are considered – the “construction” period is combined with the period prior to the commencement of construction. The results of the employment regressions indicate similar findings to those provided by the analysis of industry earnings, with little evidence of statistically significant impacts of the highway expansion projects on employment in the towns most directly affected by them. The results of the analyses of industry earnings and employment for the various case studies appear to be strikingly consistent across locations, an important finding considering the different growth rates and industrial composition of the various case study locations. We cannot completely rule out the possibility that the projects did have some positive effect on employment, but that it was not distinguishable due the underlying amount of variance in the data. Were this the case though, the effects in question would still be quite small, in most cases on the order of a couple of percentage points. We also note the effect of the recent recession on our results, especially those using the employment data. Despite our efforts to control for macroeconomic trends, the recession undoubtedly had profound effects on private investment and business formation, both of which coincide with the latter years of our data. These years would also be the period when we would expect to see any growth effects from the improved highways. With these caveats in mind, we may be able to draw some conclusions about the relative role of transportation investment in economic development. First, the lack of evidence of statistically significant effects on economic growth from the types of projects considered here are not unprecedented. Indeed, as our review of the empirical literature on transportation infrastructure and economic development revealed, a number of recent studies have indicated lower, if still positive, overall returns to transportation infrastructure. This seems plausible. While the introduction the of the Interstate highways often provided order of magnitude-type improvements in travel times between large cities, most contemporary projects are generally smaller in scope and involve modifying a relatively mature network. In a similar vein, our review of the factors affecting economic development seemed to indicate a continuing, non-trivial role for several non-transportation factors, some of which may be amenable to economic development policy. We are certain that there will continue to be significant amounts of transportation investment in highways and other networks in the years to come, whether justified explicitly by economic development criteria or not. An important consideration for the evaluation of these investments should continue to be whether or not these projects generate net social benefits. Evaluations focusing on the user (and to a certain extent, nonuser) benefits that flow from a given transportation project will naturally be able to account for benefits like travel time savings, which are valued by users but which may not show up in conventional economic accounts. Under this type of evaluation, projects that might be justified on economic development grounds (i.e. employment or output effects) would likely be funded anyway, since they would almost certainly generate positive net social benefits. This conclusion also applies to transportation investment undertaken for purposes of fiscal stimulus and macroeconomic stabilization. To legally ride the LRT in Minneapolis, you need to buy a ticket, or tap in with your Go-To card. 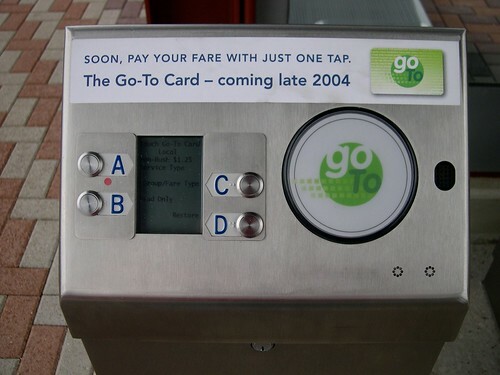 I recently made a trip to DC via LRT (at Franklin Avenue) (and a bus, and an airport shuttle, and an airplane, and a Metrorail train, and of course, on foot), and was anticipating having to tap the Go-To card reader at the middle of the station where it had been since 2004. Lo and behold, when I arrived, the reader was at the station entrance, where it should be, and not in the middle where it had been, where I might spend an extra 15 seconds walking and miss the train. I don’t know when this change took place, but it is the kind of attention to operational detail and consideration of the customer’s time that is important. So thank you unnamed persons at MetroTransit who ordered the Go-To card reader moved, or added another one.